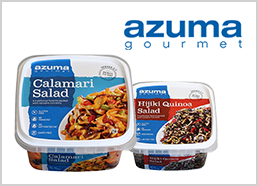 MENU IDEA | Azuma Foods International Inc., U.S.A.
Age Tofu also can be used for sweet snacks. Just pour Japanese brown sugar caramelized syrup over defrosted Age Tofu for a simple but intriguing dessert. Warm up Purple Sweet Potato Tempura in a toaster and serve with ice cream. Purple color from the sweet potato attracts attention to the dish, and will give a great contrast. Try coating Masago Arare on the pumpkin to make a great garnish for dessert. Simply dip sliced pumpkin in tempura batter, coat it with Masago Arare, and deep fry lightly. Add soy sauce in vanilla ice cream to create unique Japanese caramel flavor and garnish with Tobikko Arare for an easy and elegant dessert. Tender shrimp in creamy garlic alfredo sauce, served with Shrimp Swirl Pops. Sirloin and crispy Shrimp Swirl Pops. Served with mashed potatoes and an extra side. Perfect appetizer at Hot Deli section. Mix ramen noodle in our Calamari Salad, diced tomato, and cucumbers. Drizzle over ramen sauce and sesame oil to enhance the flavor. Bake mushroom topped with minced garlic, rosemary, salt& pepper, red chili pepper, and Swiss cheese. Add Calamari Salad on top of the mushroom. Simply top Calamari Salad on spaghetti, a gourmet plate with in seconds. Add Calamari Salad on Mixed Greens. The Calamari Salad is high in Protein with low carb. Sauté minced garlic, dried red chili powder, and sliced cabbage. Combine Calamari Salad with the Sauté, place on top of the sliced baguette. Make a donut shape with avocado, then place Calamari Salad inside. Calamari Salad adds vivid colors onto your food. Lemon may be an old trend for Oysters, let Tobikko do the job of add flavor and lightning up the dish with color. Add Tobikko Wasabi, and Tobikko Red on Fish Carpaccio for garnish and savory flavor. Mix in Soysauce, Lime Juice, Olive Oil, Wasabi, correct with Salt & Pepper. Finish off with Black Tobikko to bring out contrast to the dish. We have many different color and flavors for Tobikko. These will add another character, texture, and brighten your dish. Oshi Sushi (Pressed Sushi) with Tobikko Yuzu. Bright yellow garnish will add some character to your dish with tangy Citrus flavor. Form finely cut Negi Hamachi. Top off with mixture of Masago Red and Mayonnaise for delicious sauce. Form a Tartare with Crab Cake, Tuna, and Yellow Tail. Top it off with Masago Jalapeno to add some kick to the dish. Roll Prosciutto with cream cheese and Masago. Use Masago Jalapeno and Masago Habanero for thrilling flavor. Oven bake pizza with seafood toppings. Sprinkle Masago Habanero, and Masago Jalapeno to add Spice to the dish. Prepare California Roll, and toss it on a bed of Masago to add Color and Texture. Make a roll with Unagi Kabayaki and cucumber. Roll it on a sheet of Masago Natural Yellow to add some color. Flatten sticky rice on a nori seaweed, lay Gari Tako Sansai, Persian cucumber, and mizuna. Roll and serve. Dip Tuna into tempura batter, toss with Masago Arare, pan fry but do not fully cook. Cut and serve with sauce of your choice. Wash Mochi Ice with juice or water to take flour off. Bathe the Mochi Ice into Masago Arare. Spread Mentai Paste on bruschetta, oven bake for a couple minute till brown. Server with Umami Toppers. Just drop a Mentai Paste on an ordinary Garlic Toast to give a completely new flavor to it. Mentai Paste is good for any salad like appetizers. Slice onions, and just drizzle Mentai Paste mixed with Mayo for a great salad. Stir fry cooked pasta, bonito stock, mentai paste. Top off with Seaweed. Mixing Whipped cream cheese and Mentai Paste will be a great garnishing for Sushi Cakes. Mix Potato, Corn, Mentai Paste, and milk. Form a shape and dip in a tempura batter, pat panko and deep fry. Make small canapes on a single dish to make it into a great appetizer plate. Ankimo comes in a tube shape, which will be very easy to make tartare. Top off with Tobikko to add bright color. Grill scallop, lay Ankimo and asparagus on top for a very easy and tasty appetizer. Just adding Ankimo into a soup will give it a full & thick delicious ocean flavor. Top off Angel Tears on any type of sushi rolls to make it look more extraordinary in just one touch. Just add some Angel Tears on any dessert, and it will brighten up the dish. Canapes like cheese and crackers are always looking for some decorative addition. It goes well with any kind of food since it is made with White wine. Just mix Osushiya Salad with boiled egg yolks. Top it off with colorful Tobikko for a great starter. Osushiya Salad is made with Crawfish and Fish Roe, easy to prepare and holds great on Tartare. Cover Spicy Tuna Roll with avocado, and drizzle over with Osushiya Salad and Mango sauce. Roll Rice Paper with Osushiya Salad, sushi rice, egg, avocado, lettuce leaves and bell pepper for colorful and tasty Salad Roll. Slice Osushiya Nishin, and drizzle over olive oil and dashi sauce for a very easy to prepare Carpaccio. Ready to use, marinated with light sweet vinegar. Just slice and serve. Just press down Osushiya Nishin onto a Sushi Rice, and will become a great Oshi Sushi. Slice Osushiya Nishin, and make a whole new Nigiri. Put sticky rice in the Ajituke Inari. Topped with sliced kiwifruit, diced mango, and Ajitsuke Shiitake Slice. Sweet and sour is a perfect match. Put sticky rice in the Ajituke Inari. Topped with sliced kiwifruit and diced mango. Sweet and sour is a perfect match. Press sticky rice and sesame on a sheet of Nori. Wrap with fried Ebi Tempura. Cut and serve. Place fried Ebi Tempura and Vegetable Kakiage on top of rice. Drizzle over Tempura Sauce. Mix Osushiya Mongo, shiso basil, and branched nameko mushroom together. Drip of soy sauce will enhance the flavor. Simply make Nigiri with Osushiya Mongo and Shiso together. Lay Osushiya Mongo, put Shiso basil and roll together. Simply cut into the tube, and serve. Simply deep fry Iidako Karaage, lay on a plate with lemon and parsley. Goes great with beer. Just add Iidako Karaage on any salad. This will give a full flavor on a simple salad. Cream, oil, sesame, any type of dressing will go well. Deep fry Iidako Karaage, toss them with green onion and sesame dressing. Top mixture on the fried noodle. Crunchy texture and flavor are unstoppable. Mix Madako, gochujang, and soy sauce. Madako goes very well with spicy sauce. Lay cucumber on the side to refresh pallet. Simply lay Madako on a plate, drizzle olive oil, yuzu sauce, salt & pepper. Garnish with radish sprouts for taste and color. Place fried Ebi Tempura and Vegetable Kakiage on top of rice. Serve with Tempura Sauce.